With assistance of magnet resonance imaging, or in short MRI, we can take anatomical and functional images of the human body. This way bones, muscles, tendons, ligaments, joints, vessels, organs and even metabolic processes or chemical compositions can be analyzed. In opposite to X-ray technique, no radioactive radiation is used to create the images. The MRI scanner works with a magnet and sending and receiving coils. The magnet and the radiofrequency coils activate hydrogen atoms in a way that they give a special resonance to be measured by the receiving coils. Based on the received information, an anatomical MR image is created by usage of powerful computer systems. Subject to the area to be examined, receiving coils are placed directly onto the corresponding area. If you want to examine the head, you have to surround the head by a coil. If you want to analyze a knee, a special coil around the knee is used etc. An MRI examination takes about 20-40 minutes on average. In some cases, it can be necessary to apply a contrast agent intravenously during an MRI examination. The contrast agent enables us to make features of a certain tissue or vessels visible that would not be visible without the contrast agent. Contrast agents are employed, for example, during MR angiography, tumor or stroke imaging. The MR contrast agent does not comprise iodine in opposite to CT contrast agents and is normally well tolerated by the human body. Restricted use is indicated in case of chronic kidney disease. 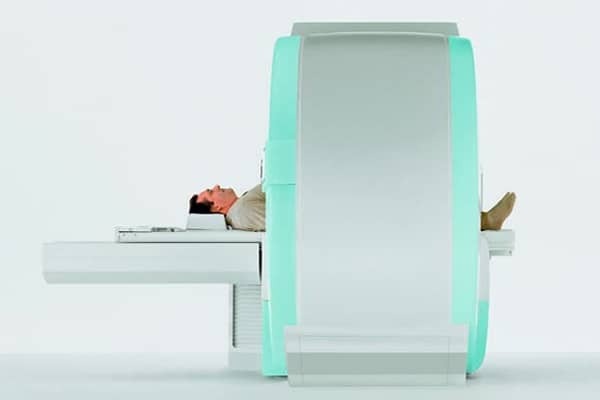 At Beta Klinik we use Bonn´s first and only high-field MRI system with 1.5 T. The open MRI is ideal for claustrophobic patients or those enjoying maximum space. In addition the open MRI is also suitable for patients up to 250 kg (500 lbs.) who maybe cannot be examined in conventional MRI systems or only very uncomfortably. The high-field of the open MRI of 1.5T makes it possible to take high-definition images – indispensable for a reliable diagnosis. Functional examinations and movement examination like flexion or extension of the back are also possible. Additionally, we are able to perform fMRI (functional MRI) examinations of the brain with our open MRI system. This includes, for example, measuring correlates of cerebral activity (BOLD fMRI) or the location and direction of nerve tracts (fMRI tractography, DTI fiber tracking), which is useful for the pre-surgical planning of brain surgery and neuropsychological research. 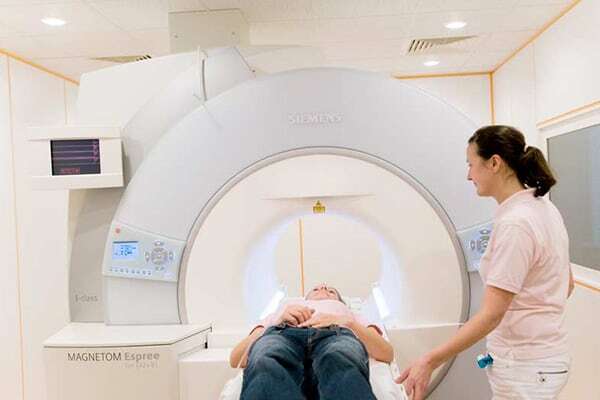 Therefore, not only patients but also physicians, giving further treatments, gain profit from our open MRI scanner. With the open MRI system, we can examine bones, muscles, tendons, ligaments, joints, vessels organs and metabolism processes as well as chemical compositions of tissues. Furthermore, Beta Klinik has a state-of-the-art 3 tesla MRI scanner. It enables us to perform specific examinations on the brain as well as joints and delivers an exceptional image quality and resolution. The breast carcinoma is one of the most frequent malignant tumors of women in Germany (46.000 new cases per year). That implies a lifetime risk of 12 % for not handicapped women and 80 % for high-risk patients. 70 % of all carcinomas appear in patients without known risk factors. The tumor related rate of mortality is 40 %. Meanwhile more and more breast cancer specialists prefer the magnetic resonance imaging of the breast (so-called MR mammography), which can prove earlier and more reliable breast cancer focuses, than the classic conventional x-ray mammography. The MR mammography images the breast multidimensional, is without radiation and avoids the compression of the breast (which is necessary for x-ray and unpleasant for many women). With the classical x-ray mammography, depending on the density of the breast tissue, only 20 to 80 % of all breast cancer results can be found, whereas the MR mammography detects 80 to 90 % of all cancer focuses ¬– regardless of the breast tissue structure. For comparison, the manual examination of the breast has a sensitivity of only 50 % and a minor specificity (accuracy of result detection). Self-examinations (own palpation) increase the biopsy rate, but not the sensitivity. The classic x-ray mammography, has a remarkable bad sensitivity, especially for precursors of cancer (high grade ductal in situ carcinoma – DCIS), which do not get beyond 54 %, because a large part does not show microcalcifications. Altogether the sensitivity of the conventional mammography is only 28 to maximal 41 %, at a specificity of 98 %. Therefore almost 60 % evade the diagnostics and from the 41 % detected tumors, 98 % are in average major carcinomas. The so-called interval carcinoma is usually indistinguishable in the preceded x-ray mammography. Frequent “false positive” results of the x-ray mammography can be reduced by the MR mammography: These are usually focuses with microcalcifications or overlays, which seem to be suspicious and therefore a biopsy is taken. In the end they are benign. On the other side 30 to 40 % of all invasive carcinoma show microcalcifications. A secure classification if it is benign oder malignant is not possible with the x-ray mammography. Through inclusion of ultrasound the sensitivity increases to approximately 50 %. Whereas the MRI has a sensitivity of over 80 % and a specificity of approximately 90 %. It can detect tumors, which cannot be seen in the x-rays. These numbers and further current studies show that the MR mammography not only detects breast cancer securer than the x-ray mammography, it can also detect it earlier. Even benign precursors of the invasive carcinoma can already be detected contrary to the x-ray mammography, which is primary only suitable to detect already existing invasive carcinomas. The MR mammography leads to amendments of the treatment of already detected tumors, because in 18,75 % of the cases, additional contralateral tumors are found or the tumor spread is outlined different and in 8,7 to 9,7 % of the cases the surgical intervention is changed. Furthermore the MR mammography can gather premalignant atypical ductal hyperplasia with a sensitivity of 91 %, compared to 26 % of the conventional mammography. Cost-benefit calculations already exist for high risk patients: When solely the conventional mammography is used, costs equivalent to 11.771 € per tumor arise. Costs of 9.024 € arise using MRI without x-ray. The MR mammography can replace the so far used x-ray mammography in almost all cases. In circumstances where women have a pacemaker or other sensitive medical implants, the implementation of a MR mammography is not possible. in the context of the annual breast cancer screening: at the age of 40, without age limit and in place of the x-ray mammography. in the case of conspicuous findings at the x-ray mammography for prevention or better control of a biopsy. for the distinction of cicatrices and relapses after the treatment of a breast carcinoma. previous of each therapy for the verification/preclusion of a second, unrecognized carcinoma focus in the same or reciprocal breast. In general you might say that the MR mammography is a reliable method of the breast cancer screening for every woman. This includes women with family history, as well as women who appreciate an optimized health care.